Corked: A Memoir by Kathryn Borel Jr. is one of the most moving, funny, twisted memoirs of this or any other year. 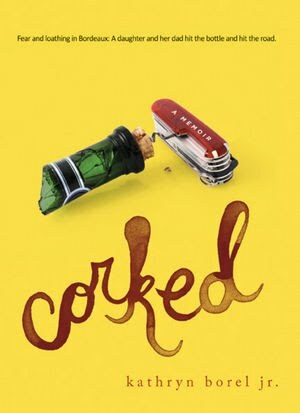 Ostensibly a story of a father and daughter wine tasting tour through France, the tale is much darker underneath this glamorous premise dealing with death, family dysfunction, dissapointment, and daddy issues. Ms. Borel's work here is not always easy to take, but it is constantly riveting and she is a likeable enough prescence in the book to maintain reader interest and good will even when the narrative gets tough. M & L: Why do you think your dad loves wine so much and is there anything else he is infatuated with on the same level? KB: "My father has always been one of those people who creates meaning through narrative. I think he's a natural story-teller... but my hunch is that his impulse for making stories comes was born out of being raised during WWII, having to move every few months, watching his home be destroyed by a bomb during an American raid in southern France, eventually coming to Canada with his mother, father and sister and having to start over. He's not a person who has any tokens from his childhood, so he became really adept at creating his own out of his recollections. " "When it comes to his love of wine, it's not the technical aspects that he's drawn to, it's the romance that he loves. He loves that with each bottle, he meets a new character, a different personality that has its own story, that's been born from a specific time, in a specific climate and from a specific soil, influence by a myriad variables, and coached into another kind of maturity by a winemaker who has his or her own story to add to the mix. For him, there's a narrative to every bottle in his cellar. They're 750 ml evocations. I think that's what he's obsessed with. " "As for other infatuations -- nothing as much as wine, except for maybe WWII history and the psychology of cats. The former's attraction is obvious; I can't figure out the cat thing.". M & L: Was the issue of wine between you and your dad more about your wine knowledge or about your enjoyment of wine? KB: "At the beginning of our trip, I thought the issue was my own lack of understanding about terroir, fermentation, vine orientation, etc. With every winemaker we met I would ask this battery of poorly-articulated questions, only to have these completely opaque answers come back at me. In the first few days, I realized I hadn't cracked any part of the code. Then I realized I was asking the wrong questions -- and that I wasn't listening to the right person. Eventually, once I started asking myself, "Hey, stupid, what do YOU, Kathryn Borel, think of the wine?" I started getting it. It was just a matter of relaxing, breathing, and listening to what the wine was telling my mouth and brain. And that's when I started enjoying myself." M & L: At what point did your dad know you intended to make a book out of your experience with him? What were his feelings about it? KB: "The intention was always to write SOMETHING. I am inordinately terrified of my father's eventual death, and while I didn't tell him that this was my primary motivation for suggesting the trip, he knew that I wanted to try and commit something to paper once it was all over and done with. And he was fine with that. But when we came back to Canada after the three weeks on the road, I didn't think I had enough for an actual book. So I drawered my notes for two years. Then, in early 2007, I started writing. A few months later I had a book deal, and two years after that I had a completed final draft. My father read it and became very emotional -- he was proud of what I'd done, but also a little piqued, I think, about seeing all my thoughts about his mannerisms and behaviours laid out like that. But then he read it again, and then a third time, and a fourth and fifth, and understood that the book was a love letter, and that my honesty about my own uglinesses and his too had come from a place of respect and love." M & L: Did you show your dad (or anyone else) the manuscript before it went to press? KB: "Yes -- I showed the manuscript to my father, mother and a few friends. Two of my greatest counsels were my amazing novelist friend Sheila Heti and film producer friend Julia Rosenberg. I also worked with a Canadian editor, Leah Fairbank, and an American editor, Emily Griffin -- who are both brilliant and understood what I was trying to get out of myself even when I was crying on my kitchen floor, confused and eating dry spaghetti from the package." M & L: Has this book changed your relationship with your dad and/or family? KB: "It has. It has made the way we communicate so much cleaner "
"It's funny -- I actually have a film rights agent who's currently shopping around the book. So it's something I think about. I love the French actor Daniel Auteuil -- I think he would do a terrific job. As for me... I guess I'd have to be played by Chloris Leachman. Obviously. "